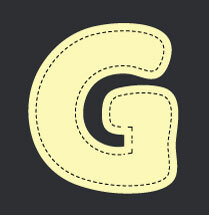 Galley – The galley is the compartment of a ship, train, or aircraft where food is cooked and prepared. It can also refer to a land-based kitchen on a naval base, or to a particular design of a household kitchen. The best explanation as to its origin is that it is a corruption of “gallery”. Ancient sailors cooked their meals on a brick or stone gallery laid amidships. Food onboard ship is immensely important – and so the galley does play a vital role in shipboard life. You can think of the bridge or the engine room – but the output of the galley can play a major role in whether seafarers enjoy their life at sea. Through history the importance of food at sea cannot be overstated. Whether at war or peace – seafarers have to be well fed. As illustrations of the output of different famous galleys – on “HMS Victory” the crew each consumed 5,000 calories a day, which came from the main meal – usually boiled beef with suet pudding, or boiled pork with peas.This one ‘hot’ meal – by the time the men sat down to eat it was probably cold – was cooked on Victory’s “Brodie stove”. Regardless of whether you were Nelson or an ordinary seaman, every member of Victory’s 821-man crew ate food that had been cooked on this single, surprisingly small stove. Onboard another famous vessel –the role of the galley was somewhat different. The “RMS Titanic” employed a huge catering staff. A total of 421 men and women were employed in the “Victualling Department”, and of these, 322 were stewards who performed more than 57 different functions in each class’s dining saloon, public rooms, cabins and recreational facilities. These laboured almost continuously in Titanic’s massive galleys to prepare more than 6,000 meals a day. The main galley, which churned out food for first- and second-class passengers, featured serving pantries; a butcher shop; a bakery; vegetable kitchens; specialized rooms for silver and china; rooms for wines, beer and oysters; and huge storage bins for the tons of coal needed to fuel the 19 ovens, cooking tops, ranges and roasters. Far more austere, third-class meals featured items such as hearty stews, vegetable soup, roast pork with sage and onions, boiled potatoes, currant buns, biscuits and freshly baked bread with plum pudding and oranges. Today’s ships are no less reliant on the galley – but things on cruise ships have changed away from one focal catering point. The largest cruise ship “Harmony of the Seas” has 31 bars, restaurants and cafes, apparently offering the largest range of food and drink available at sea. The figures are daunting. The new ship will need 50 tonnes of ice cubes and almost two million litres of fresh water every day. On an average seven-night cruise, an Oasis-class ship requires, 5,000 dozen fresh whole eggs, 100 gallons of chocolate ice cream, 2,100lbs of lobster tail and 2,500lbs of fresh salmon onboard. With 5,400 passengers and over 2,000 crew to feed – you can perhaps anticipate the sheer scale of the catering venture. For most other vessel types the demands to produce are perhaps on a smaller scale, but the importance of quality is just as vital. 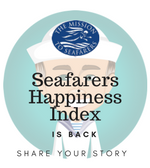 In the Seafarers Happiness Index, the issue of food quality is an ever present concern. The feeding rates, quality of ingredients, and the competence of cooks and catering staff are themes which reoccur throughout each of our reporting periods. One of the biggest challenges facing cooks is the need to provide quality sustenance for multi-national crews. Food on-board, indeed the whole dining experience, can have a massive effect – and can influence not just health, but mental wellbeing too. If the galley produces poor quality food, then seafarers can be left feeling depressed, whereas those who eat well have renewed vigour, and were generally far more upbeat about many aspects of life at sea. The galley can sometimes be forgotten, but it is an extremely important part of the ship. Garbage – Rubbish, garbage, trash, waste – call it what you will, but it is a major issue for vessels and they need to have a means of dealing with it. The days of throwing things over the side ended a long time ago, and simply burning everything may not be an option either. Yes, for centuries seafarers threw their garbage over the side. Back in the day this probably did little harm to the environment. The waste products of earlier days were mostly natural materials, biodegradable, and food for the creatures of the ocean. But as plastic has taken a hold, then by contrast, modern packaging products use materials which persist in the marine environment and so require special processing on board a ship before disposal. According to the regulation MARPOL 73/78, ship’s garbage is made up of distinct categories – they are domestic, cargo associated, food and maintenance waste. Operational wastes’ means all solid waste (including slurries) not covered by other MARPOL Annexes that are collected onboard during normal maintenance or operations of a ship, or used for cargo stowage and handling. These include cleaning agents and additives contained in cargo hold and external wash water. Each kind needs to be dealt with in the best way. Annex V of MARPOL 73/78 designates what waste can and cannot be dumped at sea – and so states what can be done with food wastes, domestic and operational wastes, all plastics, cargo residues, cooking oil, fishing gear and even animal carcases. It also introduces specific restrictions in certain areas of the world’s oceans, designated as Special Areas where the marine life is endangered. Effectively, the regulations are now about preventing the discharge of waste at sea. Where in the past most categories of garbage could be discharged in limited circumstances, that rule has been reversed and most waste streams may now not be discharged at sea except under certain strict conditions. In addition, written evidence of compliance must be readily available. To ensure that garbage is managed and handled properly, every ship of 100 gross tonnage and above, and every ship which is certified to carry 15 or more persons, must have a “Garbage Management Plan”. As with most forms of ship plan, this needs to be adapted for individual ships and must be available in the working language of the crew. The Master is to ensure that each new member of the crew receives training in the Garbage Management Plan. The plan is to be regularly reviewed and the Master should check that the plan is being correctly adapted as part of his weekly inspections. While all ships over 400 tons and above or certified to carry 15 persons or more must implement a planned garbage management system and maintain a “Garbage Record Book”. The intent of the Garbage Management Plan is to provide a systematic approach to the enforcement and control of garbage by the ships as required by MARPOL 73/78 Annex V / Regulation 9 (2). Instructions are contained in such plan for ships’ crew to follow, in regards to the collection, storage, processing and disposal of ship generated garbage including the use of equipment on board. Efforts should be made to minimise generation of garbage as well as its disposal at sea, and should be landed wherever possible. In particular cans/metal/glass (stowed in blue bins) should be landed wherever recycling facilities exist, instead of disposing at sea (even when permitted by MARPOL).Training is an important part of the garbage handling process – and the requirements of garbage management plan are discussed with all new crew members during their familiarisation training. This ensures that people fully understand their duties in relation to the plan and the importance of dealing with waste properly. The vessel should have signs posted, stating what substances can be disposed of overboard and the required distances from shore. Where a ship is matters – and no disposal should be made without the vessels’ position being confirmed and the officer of the watch’s approval. This is especially critical when the vessel is navigating near to the coast or within designated special areas. Garbage needs to be safely and cleanly stored – and so a storage area should be positioned to make sure that bins are protected from the sea. While only cargo residues which have not been classified as a marine pollutant should be discharged overboard. Even then it is best to process as much as possible in port at an appropriate reception facility. Making a mess of the garbage and record keeping is a serious issue – and when things go wrong or if records are not correctly kept, then it can all too often result in a detention, a fine or withdrawal of certification. The ISM Code (1.2.1), also requires the ship to take measures to avoid damage to the environment. This is a massively important issue – both from a legal, but also a moral perspective. The seas need to be kept clean – and shipping has to do its bit. Gangway – A gangway is the term used to describe the apparatus used to help a person get onto (embark) and get out (disembark) of a ship. This is a form of laddered ramp which slopes away from the vessel to the shore, or sits just above the water while at anchor. In ships, gangways are mainly used by passengers or crew to enter or exit the ship. They are sometimes called “accommodation ladders”. Despite how important they are, and how often they are used – they used to be excluded from the ship construction regulatory framework. Now though, amended SOLAS regulation II-1/3-9 requires means of embarkation/disembarkation on new ships built on or after 1 January 2010 to be constructed, tested, installed and maintained in accordance with IMO Circular MSC.1/Circ.1331. Classification Societies now initiate inspections as part of Cargo Ship Safety Equipment and Passenger Ship Safety surveys as and when authorised by the ship’s Flag State Administration. So gangways are viewed as proper pieces of ship’s equipment – rather than an afterthought. It is not always the case that a gangway is part of the ship’s structure or equipment. At cruise terminals or ferry ports, very often a more permanent form of gangway is used – this can be a large structure to allow many people to have safe, quick and easy access to ships. The term “gangway” comes from the Anglo-Saxon words “gang” for “path” or “passage” and “wey” for “way.” So a gangway is designed to create a pathway which can be used to cross a space. In its first maritime usage, a gangway used to be a narrow passage that joined the quarterdeck to the forecastle of a sailing ship. Gas carriers – A gas carrier (or gas tanker) is a ship designed to transport LPG, LNG or liquefied chemical gases in bulk. The problem with shipping gas had always been that the volume taken up by cargo would require too large a vessel to make it possible. That hindered gas shipping for a long time – then the concept changed, and technological advances meant that gas could be liquefied for ease of storage or transport. Michael Faraday was the first to experiment with liquefaction of methane in the mid-nineteenth century. When natural gas is cooled to below its liquefaction point of about minus163 degrees Celsius at atmospheric pressure, it forms a liquid with a specific gravity in the 0.45 range. Here is the key for shipping, as when liquefied there is a 600:1 reduction in volume. In the mid-1950s, an early concept for the transportation and use of LNG was from the US Gulf Coast to Chicago. The plan was to liquefy it, transport by water, and vaporize it in the food processing industry, using the cold for refrigeration and making the gas available for industrial use. This plan fell through – but in the late 1950’s an opportunity to sell LNG to the UK developed and Constock aligned itself with the British Gas Council to develop the world’s first ocean shipping system for LNG. On January 25th 1959, the “MV Methane Pioneer” left the Calcasieu River on the Louisiana Gulf coast with the world’s first ocean cargo of LNG and sailed to the UK where the LNG was safely delivered. The success of the “Methane Pioneer” caused Shell to order two purpose built LNG carriers to be constructed in the UK; the “Methane Princess” at Vickers Armstrong and the “Methane Progress” at Harland and Wolff. These ships had a capacity of ~27,000 cubic meters of cargo and were fitted with Conch independent aluminium cargo tanks. They entered the Algerian LNG trade in 1964 and between them made ~1,000 voyages before being scrapped in the mid 1990s. LNG carriers are fitted with independent cargo tanks and with membrane tanks. The cargo containment systems will generally be either a membrane or sphere type. The Membrane systems is a liquefied gas tank where the cargo is contained by a thin stainless steel or nickel alloy flexible membrane. There are two membrane systems in use. In both cases the insulation is fitted directly into the inner hull and the primary barrier consists of a thin metal membrane less than one millimetre thick. While “Moss Tanks” are spherical tanks are generally produced in aluminium or 9% nickel steel. The sphere is welded to a steel skirt that is connected to the hull of the ship and is then free to expand and contract as necessary. Insulation is fitted to the outside shell of the sphere. Gas carriers tend to bebuilt for dedicated projects – and these can last for decades. As an illustration Qatargas has helped to develop Q-Flex and Q-Max ships, each with a cargo capacity of between 210,000 and 266,000 cubic metres in a membrane type cargo containment system. These new vessels will be used to transport LNG from Qatargas 2, Qatargas 3 and Qatargas 4 to markets around the globe. A total of 32 vessels (19 Q-Flex and 13 Q-Max) have been built, and are likely to be in service for a long time to come. Guards – In recent times the issue of armed guards onboard ships has come to the fore. The Somali piracy epidemic which overwhelmed shipping from 2008 until 2014 saw a need for seafarers and vessels to be protected from attack. Initially guards were not universally welcomed. Indeed there were many concerns about the standards of guards used and companies which supplied them. However, Somali pirates kept taking seafarers hostage and hijacking vessels – so a change was needed.Flag States were encouraged to debate the issue at the IMO – and the debate was no longer focused on whether they should be used but how they could be used safely, with the emphasis on accreditation and accountability. In 2011 the International Chamber of Shipping (“ICS”) announced its change of stance on armed guards, and finally it was becoming more acceptable – which made it easier to police the use of what became termed “Privately Contracted Armed Security Personnel”. Even the Best Management Practice 4 (BMP4) guidelines recognised that armed guards were being used. The unique selling point for the security companies has been that to date no ship with armed guards has been hijacked. There is now an ISO Standard – 28007 which covers armed guards, and most major flag States allow their use. Most teams deploy 4 personnel onboard, though there can be smaller teams. They will bring onboard their weapons and ammunition, and will liaise with the master as to how the security operation will be managed. The master retains full control and responsibility for the vessel. There are some serious stumbling blocks to using guards – one is the liability if something goes wrong, and there is the use of force issue. Just what can the guards legally do to deter an attack? There have been videos on YouTube which have shown what can happen if excessive force is used – and it does not sit well with the courts when this happens. BIMCO develop a standard contract for employing armed guards – the so called GUARDCON – which helped the situation. While there were also attempts to draw up a standardised set of Rules for the Use of Force (RUF) – these were called the 100 Series Rules. Most uses of armed guards are positive – they provide reassurance for crews and are still protecting vessels from pirate attacks in the Indian Ocean today. Despite the fact that attacks have dropped dramatically there are still vulnerable vessels which deploy guards. The Indian Ocean and Somali piracy problem was one which was almost perfectly suited for the use of armed guards. The fact that so many attacks were in International Waters made it a far easier state of affairs to manage. Unfortunately other pirate affected areas are not so simple – and off West Africa and in SE Asia, despite a rise in hijackings it is not possible to use armed guards in the same way. Historically merchant ships always tended to be armed – whether in antiquity – indeed the Romans and Greeks were heavily armed. The golden age of piracy saw ships of all kinds bristling with weaponry. From swords to muskets, cannon to bow and arrow – ships have long had to fend off attackers, and it seems incredible that in the 21st Century things seem to have come full circle once more. GMDSS – The Global Maritime Distress and Safety System (GMDSS) is an international system which uses improved terrestrial and satellite technology and ship-board radio systems. The GMDSS system, which became effective on February 1, 1999, ensures rapid alerting of shore-based rescue and communications authorities in the event of an emergency. In addition, the system alerts vessels in the immediate vicinity and provides improved means of locating survivors.When GMDSS was developed through the International Maritime Organization (IMO) it represented a significant change in the way maritime safety communications are conducted. It was developed to enhance safety and save lives by modernising and enhancing the current radiocommunications system. 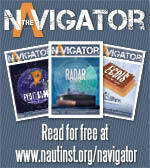 • providing mariners with vital maritime safety information. Today the IMO states that as an integrated communications system GMDSS should ensure that “no ship in distress can disappear without trace”, and that more lives can be saved at sea. Given that entire airplanes can vanish – this claim may not wholly stack up, but it is certainly a positive and progressive leap which GMDSS introduced. Since the time of the Titanic, Marine Radio has helped to save tens of thousands of lives, and become the key element in Marine Search and Rescue (SAR). Pre-GMDSS marine radio equipment was required to provide operation over a minimum specified range of 150 nautical miles.The pre-GMDSS systems were, in reality, based on 1920’s technology and if a ship was outside of the normal shipping lanes or was rapidly overwhelmed by the forces of nature, a distress alert may go unheard and the ship could sink without trace. One of the principal advantages of the GMDSS is that the system is actually an amalgam of various individual radio systems, both terrestrial and satellite. Distress alerts may be sent and received over short and/or long distances, by ships of all sizes. So every ship is able to perform those communication functions which are essential for the safety of the ship itself and of other ships operating in the same area – irrespective of the area through which it sails and its size.Under the GMDSS requirements, all ships are required to be equipped with satellite emergency position-indicating radiobeacons (EPIRBs) and NAVTEX receivers, to automatically receive shipping safety information. Obviously it is important that seafarers are trained and certified to operate the equipment. GMDSS has prompted a move away from the traditional “Radio Officer” role, and so it is vital that officers are able to operate the equipment. The First and Second Radio-Electronic Certificates are diploma and associate diploma level technical qualifications. They are designed for Ship’s Radio-Electronic Officers, who sail on GMDSS ships which use the option of at-sea electronic maintenance. 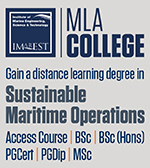 While the GMDSS General Operator’s Certificate is a non-technical operator qualification, designed for Navigating Officers. GPS – The Global Positioning System (GPS), is a global navigation satellite system (GNSS) that provides location and time information in all weather conditions, anywhere on or near the Earth where there is an unobstructed line of sight to four or more GPS satellites. The GPS system operates independently of any telephonic or internet reception, and provides critical positioning capabilities to military, civil, and commercial users around the world. The United States government created the system, maintains it, and makes it freely accessible to anyone with a GPS receiver. The United States began the GPS project in 1973 to overcome the limitations of previous navigation systems, integrating ideas from several predecessors, including a number of classified engineering design studies from the 1960s. The U.S. Department of Defense (DoD) developed the system, which originally used 24 satellites. It became fully operational in 1995.The system is actually called “NAVSTAR” (NAVigation Satellite Timing and Ranging) and the design is based partly on similar ground-based radio-navigation systems, such as LORAN and the Decca Navigator, developed in the early 1940s and used by the British Royal Navy during World War II. GPS satellites circle the earth twice a day in a very precise orbit and transmit signal information to earth. GPS receivers take this information and use trilateration (a more complex version of triangulation) to calculate the user’s exact location.Essentially, the GPS receiver compares the time a signal was transmitted by a satellite with the time it was received. The time difference tells the GPS receiver how far away the satellite is. As it receives more data it builds a better determination the user’s position and display it on the unit’s screen. A GPS receiver must be locked on to the signal of at least 3 satellites to calculate a 2-D position (latitude and longitude) and track movement. Once the user’s position has been determined, the GPS unit can calculate other information, such as speed, bearing, track, trip distance, distance to destination, sunrise and sunset time and more. The 24 satellites that make up the GPS space segment are orbiting the earth about 12,000 miles up. They are constantly moving, making two complete orbits in less than 24 hours. These satellites are travelling at speeds of roughly 7,000 miles an hour. As of February 2016, 72 Global Positioning System navigation satellites have been launched; not all remain operational. The minimum number of satellites for a full constellation is 24 operational 95% of the time; the current number exceeds this. The target number is 33 and decommissioned reserves are available to maintain the numbers. These GPS satellites are powered by solar energy, but have backup batteries onboard to keep them running in the event of a solar eclipse. Small rocket boosters on each satellite keep them flying in the correct path. • The first GPS satellite was launched in 1978. • A full constellation of 24 satellites was achieved in 1994. • Each satellite is built to last about 10 years. Replacements are constantly being built and launched into orbit. • A GPS satellite weighs approximately 2,000 pounds and is about 17 feet across with the solar panels extended. • Transmitter power is only 50 Watts or less. It is not all good news – GPS signals can be affected and accuracy diminished. So pity the navigator who only relies on one form of positioning. There are many sources of possible errors that will degrade the accuracy of positions computed by a GPS receiver. The travel time of GPS satellite signals can be altered by atmospheric effects; when a GPS signal passes through the ionosphere and troposphere it is refracted, causing the speed of the signal to be different from the speed of a GPS signal in space. Sunspot activity also causes interference with GPS signals. Another source of error is measurement noise, or distortion of the signal caused by electrical interference or errors inherent in the GPS receiver itself. Perhaps one of the biggest threats is now in the form of cyber-attack – there are real concerns about the effect of spoofing signals, where false data is fed to as vessel’s GPS receiver – or of blocking the signal completely. Fatigue – Fatigue is not some vague concept to be confused with feeling a bit tired. At sea it is becoming ever more important and problematic.